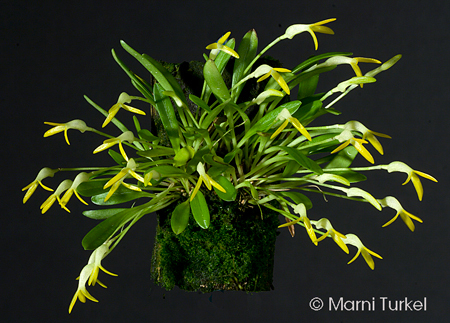 Masdevallia venezuelana 'Fox Den' x self #669 (approximately 25 seedlings per flask). 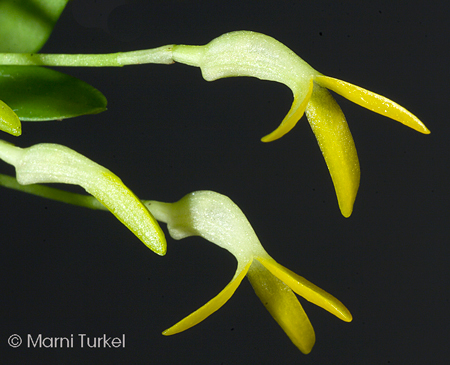 The Species: Found only in Venezuela, this delightful miniature species grows at elevations frm 2200 to 5600 feet in warm to cool cloud forest. The flowers are long-lasting and wonderfully fragrant. Culture: I have always grown this mount, usually on cork in moderate light. Currently it is growing at 56F minimum night temperatures. Like most pleurothallids, good quality water is import. Mine gets regular dilute fertilizer at every watering.